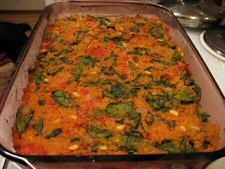 B’couscous I Love You, from Amey at Vegan Eats and Treats, is a perfect Valentine’s dish. It’s light, filled with veggies, and has a cute name–what more could you want? Perhaps a salad with heart-shaped chiogga beets? Chris and Harald Walker at Vegalicious went all out with the lovely Hearty Ravioli, a classic spinach ravioli floating in an Italian tomato sauce. Susan at Scottish Vegan shows us a variety of uses for heart-shaped cookie cutters. 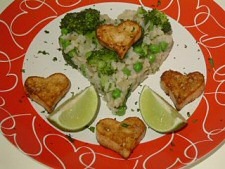 In addition to the Lime and Coriander Rice with Tofu Hearts shown above, she also uses them to make heart vegetables for a salad and heart fruits for dessert. Sher of What Did You Eat? 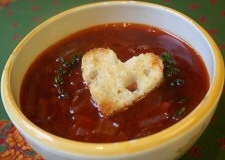 proves that less can often be more with this lighter version of French Onion Soup: Red Onion And Red Wine Soup With Tomatoes, Thyme And Heart Shaped Croutons. These beautiful Bouquets for my Valentine are sent to you courtesy of Jai and Bee of Jugalbandi. You might think they’re too lovely to eat… until you see the three exotic dips they’re served with! 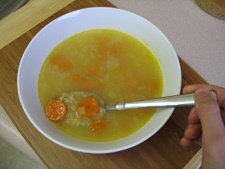 Zandria at Keep Up With Me makes a Bulgur-Carrot Soup that looks heart-warming as well as heart-healthy. Stretching the definition of “vegetable” to include sesame seeds, A Veggie Venture’s Alanna says this Armenian Tahini Bread is Armenia’s answer to cinnamon rolls. Mmmm. 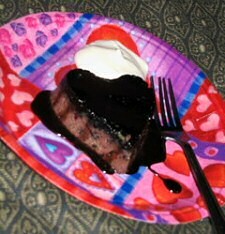 What Valentine’s dinner is complete without dessert? Bazu of Where’s the Revolution? 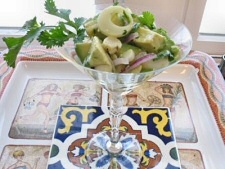 comes up with not one but two special Valentine’s dishes: Vegan Ceviche, above, and Hearts of Palm and Artichoke Heart Salad with Blackberry Balsamic Syrup. 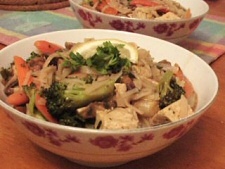 Mandira of Ahaar presents Thai Rice Noodle & Vegetable Soup, a wonderful mix of tofu, vegetables, and rice noodles. We had one write-in entry. Sera found this Simmered Sweet Kabocha by Rae at Bunnyfoot simply irresistible. 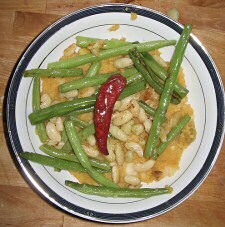 Cooking without added fats isn’t something Emily at Better Politics Through Food is used to doing, but she rose to the challenge with Green Beans and Flageolets over Sweet Potato-Parsnip Puree—and managed to use almost all the vegetables her wife will eat. Now that’s love! Creamy and smooth, sweet and satisfying. Who could ask for anything more? In a blender, process all ingredients except oat bran or cereal until well blended. Pour into a pan and mix in oatbran or cereal. 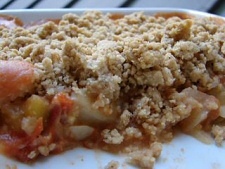 Heat until slightly bubbly, cook for 1-2 minutes, and let cool for a couple minutes. Spoon into two bowls and sprinkle with cinnamon sugar. taste the sauce, and adjust the spice/curry balance as you like it, and season with a little extra salt and pepper if it needs it. I served this over quinoa. Carla adapted Isa’s recipe for Beet Cakes to make it fat-free, and it sounded so good that I had to give it a try, shaped into hearts for the occasion. Took the grated beet and carrot and just about covered with water and cooked for 10 min until it was soft. Drained well and reserved the liquid to use for the sweet potato. Cut this into smallish cubes, cooked just covered with the liquid for 15 minutes until soft, drained (reserving liquid – I hate to throw away cooking water if I can find some use for it) and mashed with a little of the liquid. Mixed these two together and let cool for 10 minutes. To this I added the shallot and seasonings as well as 1/2 C rolled oats (quick cooking but not instant) and 1 C Homemade WW breadcrumbs. Mixed well until combined – it was a little moist but not sticky. I used a 1/4 C measuring cup and scooped out 1/4 C fulls which made a nice patty shape, covered in breadcrumbs, flattened a little and baked on a tray lined with tinfoil for 30 min at 400F, turning them after 15 minutes. They didn’t brown up or anything but were very good!! 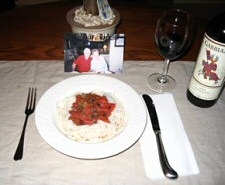 The Gluten-Free Vegan presents a complete Valentine’s dinner in a loving tribute to her dad. Myloverisvegan cooks a vegan 5 course meal, including heart-shaped Chocolate Cheesecake with Oreo Crust. 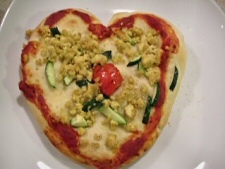 Two Vegan Sisters really heart pizza! 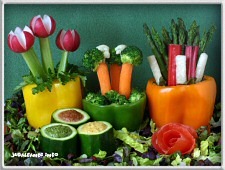 Thanks to all who participated for giving us so many great vegetable dishes to choose from. 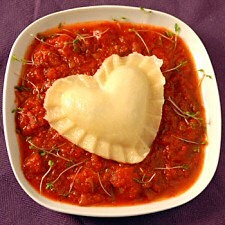 I’ll be back tomorrow with a special Valentine’s Day recipe of my own!